Peeks Around 7 is the shadowbox. This hangs on a wall between our living room and the kitchen. There is all kinds of stuff on this. Little pewter dragons, wizards, kitties, and trolls and dwarves with crazy weapons that I think go with the game Magic. 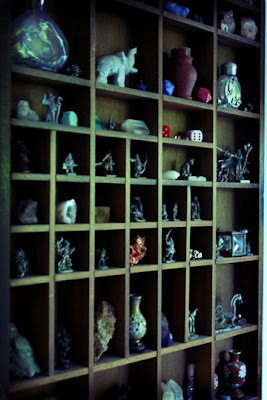 Crystals and rocks, tiny little vases, dice and other little mini bottles and boxes to stash things away in. I think the shadowbox may be an old typesetting set drawer. If it's not, it at least reminds me of one.